ICAS is working with Hope for Justice to inform and guide members, and to publicise a new ‘Slave-Free Alliance’ kite mark. What has slavery got to do with business and accountants? Didn’t slavery get abolished in 1833? David Wood looks at the issue of modern slavery and why it impacts on business. The sad truth is that there are more slaves in the world today than there ever were during the dark days of slave trading in the eighteenth and early nineteenth centuries. It is estimated that there are almost 25 million people in forced labour, sexual exploitation or domestic servitude in the world – including tens of thousands in the UK. As consumers, we are connected to modern slavery by the clothes we wear, or the food and other products we buy, where these are produced through the exploitation of others. Kozee Sleep was a supplier of beds to many well known High Street retailers who, despite carrying out supply chain audits, failed to spot what was going on. As part of Kozee Sleep’s contract, they were required to adhere to each of their policies regarding ethical trading, including how persons who worked on their premises were treated. Kozee Sleep was reliant on a third-party labour provider, and the workers that provider supplied were victims of human trafficking, forced to work excessively long hours and live in terrible conditions, with their wages kept by the traffickers. More than 45 workers were forced to share a single terraced house. In late 2014, Hope for Justice, alerted by a victim, investigated, contacted the police, and over 30 victims were rescued. Hope for Justice helped the victims out of exploitation and into legitimate work. The bed firm boss was convicted over its ‘slave’ workforce and sentenced to 27 months in prison. The traffickers were sentenced to five and three years’ imprisonment. Few businesses are actively complicit in human trafficking like Kozee Sleep was. But many could become unwitting victims of predatory traffickers, like the retailers Kozee Sleep was selling to. According to the UK’s National Crime Agency (NCA), more than 5,000 victims of modern slavery were referred to UK authorities in 2017. This represented a 35% increase since 2016. British nationals made up the highest number of cases, with Albanians and Vietnamese close behind. The Modern Slavery Act 2015 requires businesses with a turnover over £36m to prepare a slavery and human trafficking statement for each financial year. This must be posted on a company’s website with a prominent link from its homepage. In summary, the statement needs to disclose the steps the organisation has taken during the financial year to ensure that slavery and human trafficking is not taking place in any parts of its own business or any of its supply chains. Whilst the 2015 Act is fairly flexible on the content of the statement and the actions which the organisation is required to take, clearly one of the biggest risks to businesses is the reputational risk of finding a case of modern slavery within its own organisation or within its supply chain. Further, if a case of modern slavery was identified, would organisations know what to do? ICAS is working with Hope for Justice, a global non-profit organisation which aims to end human trafficking and modern-day slavery. It is active in the United Kingdom, United States, Norway, Cambodia, Vietnam, Ethiopia, Uganda and Zimbabwe, and has its headquarters in Manchester, England. Hope for Justice provides training in how to spot the signs of modern slavery and how to respond and works with the police and other agencies to rescue victims and then restore and rebuild their lives. 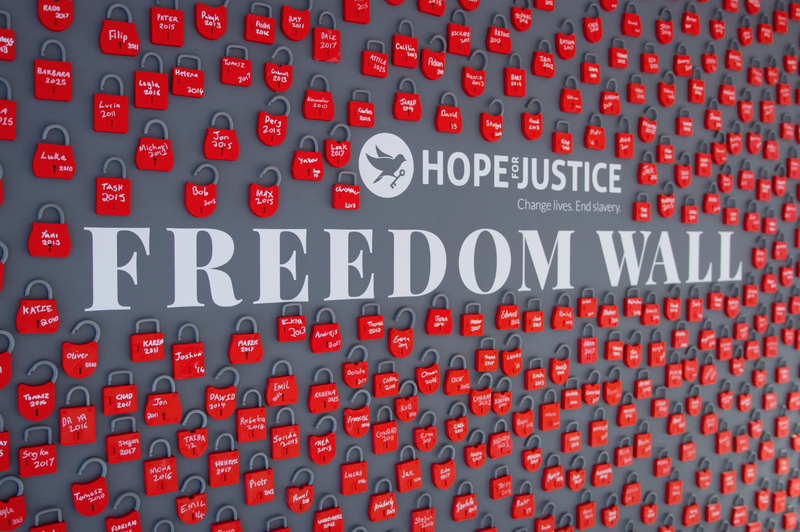 The “Freedom Wall” at Hope for Justice’s reception, with each unlocked padlock representing a victim it has freed from slavery. ICAS will help promote the issue of modern slavery to the profession and the business community, in particular, the requirement for larger businesses to make an annual statement, and will assist in establishing and publicising the ‘Slave-Free Alliance’ kite mark. Hope for Justice will help us with the provision of information and other materials, and will offer training and advice to members and businesses to support the kite mark. Further information on the slavery and human trafficking statement and on the ‘Slave-Free Alliance’ kite mark will be available shortly. Do you have questions on modern slavery, Hope for Justice, or the Slave-Free Alliance kite mark? Have you had experience of modern slavery? Let us know via the comment box below.